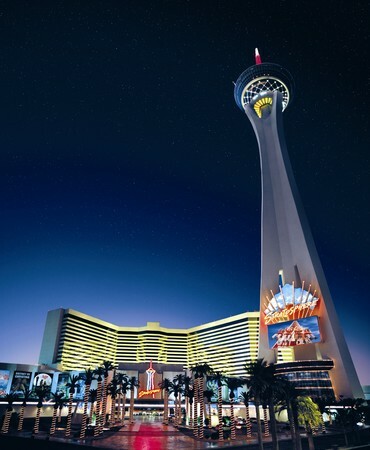 The Top of the World is located in the Stratosphere Casino, offering a one-of-a-kind bird’s eye view of Las Vegas. Perched 844 feet above the city, Top of the World literally revolves in place, rotating a full 360 degrees every 80 minutes. And while the spectacular sights are enough to get guests in the door, the restaurant’s inspired menu of re-imagined classics keeps the dining room full. 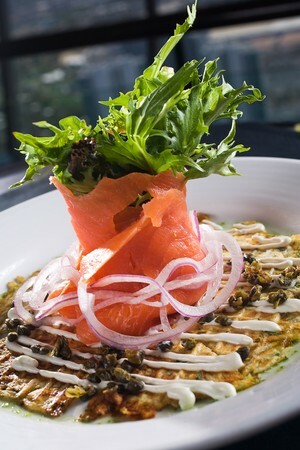 Executive Chef Jeff Giffen oversees menus constructed around fresh seafood, prime-cut steaks, and decadent specialties. With tasting menu options and private dining accommodations, Top of the World serves up a generous helping of ambiance with every meal. Top of the World opened more than ten years ago, and has had few changes from its foundations since then. The restaurant was originally headed by Executive Chef Stephen Wolff; however, it is now guided by Executive Chef Mario Andreoni, who’s been honored numerous times for awards here in Las Vegas. His reputation is solid among chefs, though he’s commercial and thus less visible than some of our other chefs here in town. His Italian heritage, French culinary training, and travels in the Dominican Republic have combined to create a classical menu with balance as well as diversity. Andreoni’s cuisine is a perfect accompaniment to the restaurant and scenery around it. 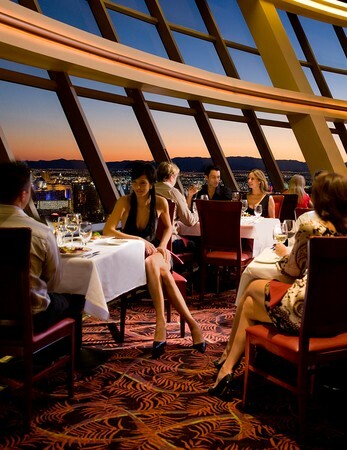 To enter Top of the World, there’s a velvet rope and a podium at the bottom of the Stratosphere, where a formally dressed staff member checks reservations, and directs diners into the foyer. Toward the left, the staff guides the uninitiated to the elevator that delivers them to the upper eschelon that is Top of the World. A helpful elevator operator warmly greets diners, and tosses out Stratosphere facts, such as that the elevator is traveling at a crisp 20 miles per hour. In less than 30 seconds and more than 105 floors, the elevator doors open and the elevator empties into the Romance Lounge, one floor above the restaurant. The view, encompassing both the restaurant and surrounding valley, takes one’s breath away. This floor is also where the main desk lies, where hosts and hostesses verify reservations, then direct diners down a flight of stairs, and wait staff courteously guide diners to their tables. There really are no ‘bad tables’ at Top of the World. Unless one has a particular aversion to restaurants that rotate, every table has a spectacular view. As the sun begins to set, blinds are lowered to keep it out of diners’ eyes. The entire restaurant is a circle – kitchen, bar, and all functions are on the inside, and tables are on the outer rim. Looking at the floor, it appears that only the outer rim rotates, and the inner, working parts of the restaurant are firmly stationary. Top of the World is an old school, classy, beautiful place to dine. The colors are rich, the carpeting is a deep burgundy, and the restaurant rigidly adheres to the Stratosphere theme. 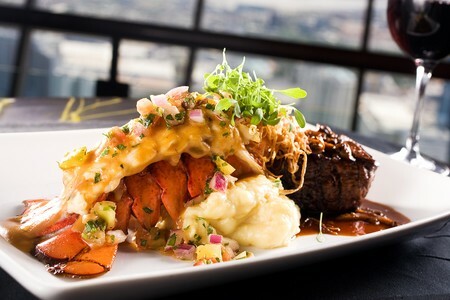 Everything, from pats of butter, to desserts, to the plates beneath them, is adorned with the image of the Stratosphere tower. 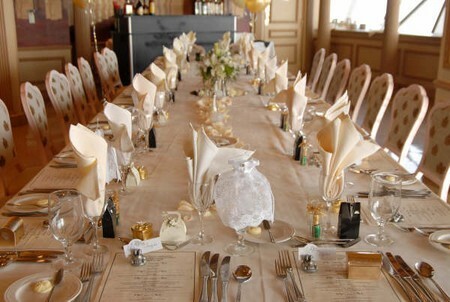 The tablecloths are a sparkling white, and the plates are white with burgundy. The table settings are complete – not a piece of silverware nor a plate is absent. We dined at Top of the World on a Sunday evening with an early reservation. It was very quiet and intimate. It’s easy to see why Top of the World has built a reputation as a romantic place to dine. The atmosphere oozes romance and whispered conversations. For being a relatively confined space, Top of the World feels very roomy and open. I’ve asserted before that any dining experience and food are only as good as those who serve it. The servers at Top of the world take special care to ensure that each diner’s needs are met. Whether it involves bringing additional silverware, making menu recommendations, or mentioning the restaurant’s soccer team, their service staff is extraordinary – each member of the team with whom we have contact is friendly, competent, and expedient. Some have also been with the restaurant for a number of years, which is not necessarily common in our transient service-oriented environment. Service for each table begins when the server delivers bread and butter. Each pat of butter is literally shaped like the Stratosphere. It’s a nice touch, and makes something as simple as bread and butter suddenly memorable. While snacking, we order our appetizers. 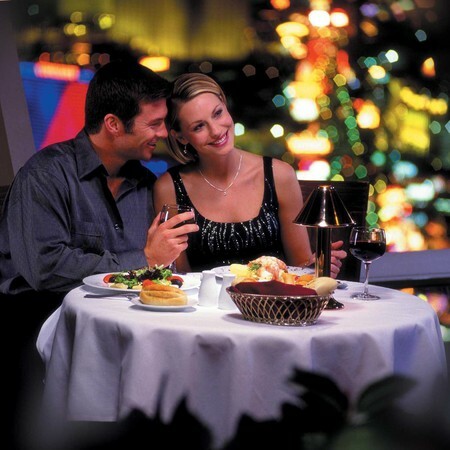 All items at Top of the World are served a la carte, although couples may wish to indulge in the prix-fixe three- or four-course dinners for two. Accompanying the menu, Top of the World’s wine list features 215 wines, available by the glass and bottle. I order a glass of a 2004 Jacob’s Creek Reserve Australian Shiraz to accompany our dinner. We begin our meal with the Lobster Bisque. The soup is thick and creamy, and served simply. Its tomato base provides a sound foundation, and the lobster lends a richness that few other ingredients can. The cognac in the bisque gives it a depth of flavor that distingushes Lobster Bisque from other, simpler soups. The next starter to arrive is the authentic Caesar Salad. This is a traditional Caesar, with Top of the World’s house-made dressing. The romaine is crisp and fresh, gently tossed with the dressing. It is topped with a homemade crouton. This salad is so fresh and simple that even my children, picky diners that they can be, cannot get enough of it. Good food simply speaks for itself. Our final starter is the Stuffed Portabella Mushroom. It is served very simply – one medium-sized stuffed mushroom centered on a gleaming white bowl, with sauce drizzled atop it. The mushroom is stuffed with croutons, gorgonzola cheese, and pancetta (Italian bacon). This is very rich, and tastes decadent. The sauce is thick, savory, and much like a gravy. This is a heavy dish, with visual impact, if a bit scant on portion size. Already satisfied, our entrées arrive. Top of the World’s menu has helpful suggestions for wine pairings with each entrée, for those that might wish for a little help. First, Lobster and Crab Ravioli is placed in front of me. The large, stuffed ravioli are served in a white bowl. They’re served with a brandy lobster sauce on top, as well as a baby lobster tail. There’s not much ‘muss and fuss’ in terms of garnish. This is a rich, flavorful pasta dish with an abundance of lobster, a great, creamy, tomatoed lobster sauce. The baby lobster tail is difficult to part with – who really wants to share? Our next entrée is the Muscovy Duck. It is set on the table and I pause and drink it in, both with my eyes and my nose. The sliced duck breast is on a plate, accompanied by slices of apple, and a wealth of peppercorns, in a flavorful fig port reduction. My only criticism of this dish: it’s wonderful, but bears little resemblance to the menu description. The combination of duck, fruit, and wine is always a good pairing, though, and the sweet and savory reduction is merely a memory by the time we finish this dish. Our final entrée is the Prime Rib. It may be a staple to all diners in Las Vegas, but a really well-prepared prime rib is as different from a mediocre one as night from day. The perfect white and burgundy plate is delivered with a large, more than half-pound slab of rare meat on it, precisely cooked as ordered. The Angus Beef has been crusted in pepper and herbs, and slow roasted. This is served with a simple jus and a mild horseradish sauce. The beef is tender, and the herbs not fussy. We accompany our entrees with Potato Au Gratin. A serving bowl filled with piping hot potatoes is set upon our table with our entrees. The sliced potatoes are cooked with Gorgonzola, Parmesan, Provolone and Romano cheeses. They’re heavy, rich, a fabulous comfort food, and are a sound accompaniment with several of our entrees. 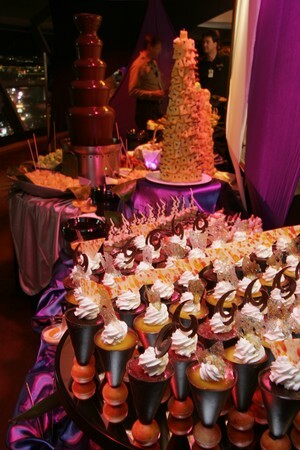 Top of the World’s desserts in particular deserve special mention, specifically the Chocolate Stratosphere. 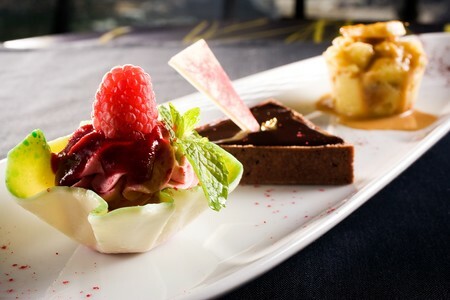 It is as visually impressive as it is decadent, with the Stratosphere Tower filled with chocolate mousse and served tableside with cascading vanilla sauce. Our meal was solid, and all of it was very good, but Top of the World is not only about the food. 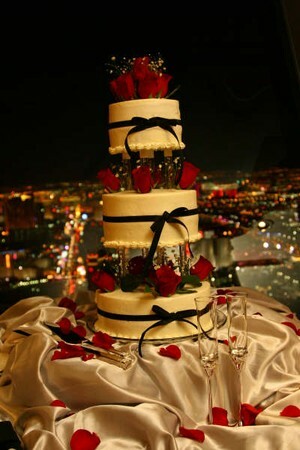 It is about atmosphere, romance, and quality of food, all combining to create a perfect moment. The kitchen demonstrates a commitment to serving classics, and preparing them perfectly, every time. Come to Top of the World for the view, and stay for the food, and the intimacy. Make your next event unforgettable in Top of the World’s extended private dining rooms. Impress your guests with breathtaking views and upscale gourmet cuisine. 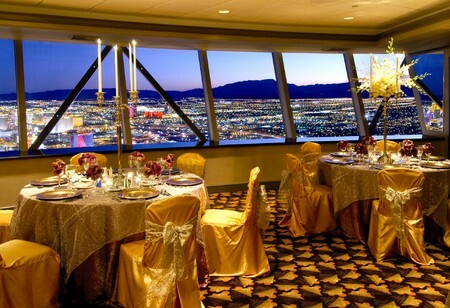 Private service staff, a personal bartender, customized menus with on-the-spot entrée selection, VIP entrance to the tower and complimentary access to the observation decks are just some of the advantages when you book a private dining event with Stratosphere's catering and private dining office. Cross Street: Las Vegas Blvd, north of Sahara Ave.
Corkage Fee: 25.00 | Call for corkage info. Main Dining Room | Dinner 4:30 p.m. - 10 p.m.
Main Dining Room | Lunch 11 a.m. - 4:30 p.m.
Main Dining Room | Brunch 11 a.m. - 3 p.m.
Are baby's allowed in the restaurant? 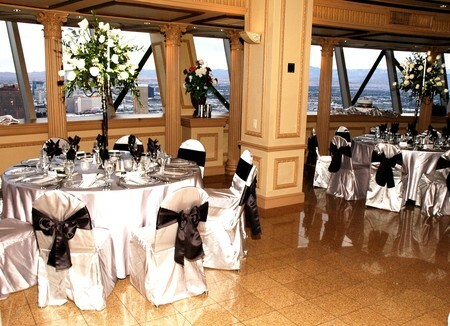 Yes, private rooms offer special menus along with breathtaking views of Las Vegas. 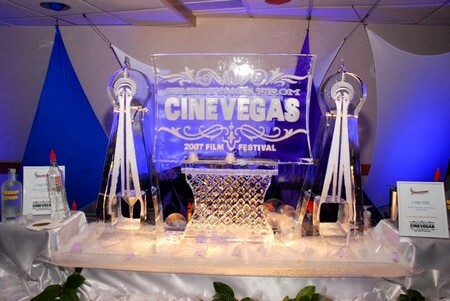 For parties of 10 or more contact group reservations by calling 702.383.4777 or email at [email protected] (Monday through Friday, 8am to 7pm and Sunday 9am to 7pm). The dress code is business casual. No sports or beach attire allowed. Do you have gift certificates that I can purchase? Unfortunately, Top of the World does not offer direct gift certificates. 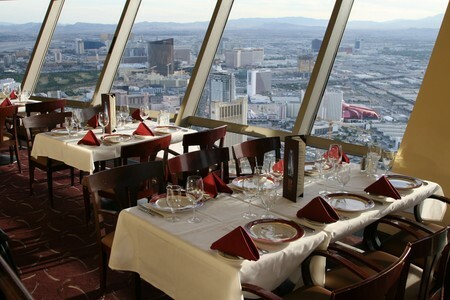 But The Stratosphere Hotel does offer a gift card that can be purchased through a hotel concierge and they can be used at Top of the World restaurant. Top of the World does supply high chairs, however they do not have a children's menu. Parties of six or more 18% gratuity added. $8 charge for sharing entrées. Seared beef tenderloin with “south of the border” spices and green papaya slaw. ¡Caliente! Served with tomato sauce and wasabi sour cream. With roasted red pepper, herb oil and balsamic reduction. Potato galette, sour cream, fried capers and chive oil. Seared rare tuna with wasabi vinaigrette. 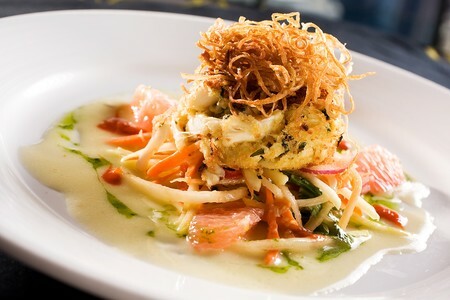 Green papaya salad, pink grapefruit, lemon grass beurre blanc, chili ponzu vinaigrette. Traditional bisque with brandy, topped with lobster cream. Mesclun greens, tomato, cucumber, red onion, toasted pecans, fennel and roasted pears. Garlic croutons, bacon lardons, soft poached egg, and Maytag blue cheese, with a white wine Dijon vinaigrette. Field greens, seared black cod filet, chili ponzu vinaigrette, and potato gaufrettes. 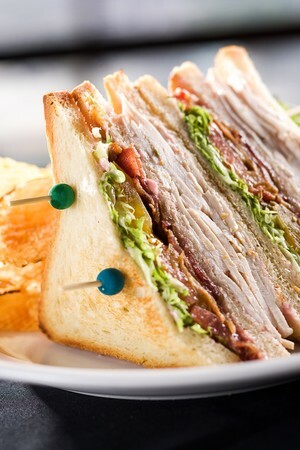 House roasted miso marinated turkey breast with herbs, cranberry, mayonnaise, bacon, lettuce and tomato. Served on pain de mie bread. Kalamata olive tapenade, onion, hierloom tomato, zucchini, yellow squash, red bell pepper and shiitake mushroom. Served on multigrain bread. Applewood smoked bacon, arugula, hierloom tomato, lemon aioli. Served on pain de mie bread. Grilled free range chicken breast with Asian marinade, served with cucumber, cilantro, mayonnaise, pickled carrot, green papaya slaw (optional jalapeño pepper for the heat). Served on a hoagie roll. With caramelized onion, sautéed mushrooms, red bell pepper and cheddar. Served on ciabattina bread. 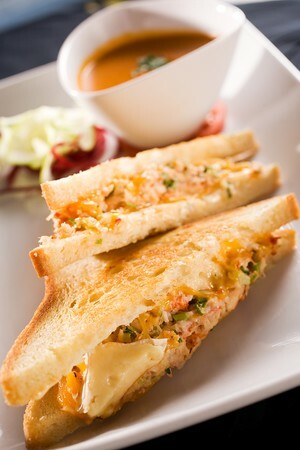 Lobster salad, cheddar and brie. Served on pain de mie bread. Cajun spices, baby frisée, rémoulade sauce. Served on a hoagie roll. Baby frisée, heirloom tomato, and pickle plank. 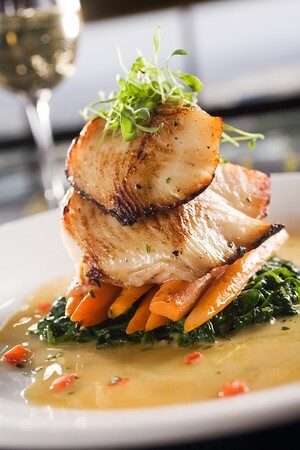 Served with a ponzu butter sauce, garlic spinach and sautéed baby carrots with ginger. Coriander dust, lemon grass beurre blanc, asparagus and shiitake mushroom. Hand made pasta, sautéed prawns and scallops, cream, garlic and Parmesan, peas, teardrop tomato, and asparagus. Soft gnocchi with ricotta and Yukon gold potato, traditional bolognese sauce and sautéed spinach. Mixed greens tossed with fresh Anjou pears, candied walnuts and balsamic vinaigrette. Martini shrimp and fennel salad and cognac-laced lobster bisque served in an espresso cup. Chilled shrimp served with white asparagus and saffron aioli. A hearty bisque prepared with fresh lobster and flavored with cognac. Encrusted prime beef served with au jus, our famous creamy horseradish sauce and seasonal accompaniments. Petite filet seasoned and charbroiled with cabernet-mushroom sauce and seasonal accompaniments. Encrusted with Porcini mushroom dust, pan-seared and served over wilted romaine. Finished with extra virgin olive oil and seasonal accompaniments. Breast of Capon roasted with sliced black truffles and natural jus and seasonal accompaniments. 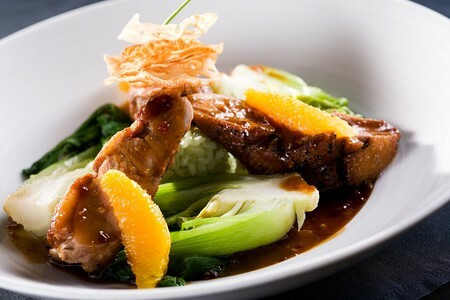 Marinated, grilled and served with an apple-apricot compote and port reduction and seasonal accompaniments. Roasted red pepper, herb oil, and balsamic reduction. Potato galette, fried capers, and chive oil. 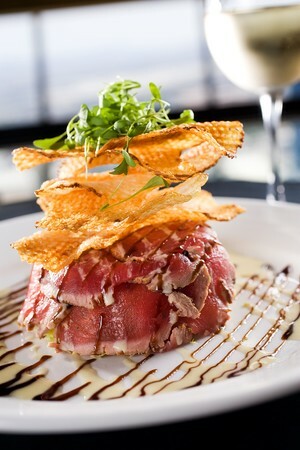 Ahi tuna, seared rare. Wasabi vinaigrette and potato gaufrette. Parmesan Reggiano, capers and white truffle oil. Three large prawns with cocktail sauce, fresh horseradish and Yucatan style shrimp ceviche. Green papaya salad, pink grapefruit, lemon grass beurre blanc. Jalapeño three peppers mignonette and yuzu juice. Roasted pear, veal jus and baby frisée. Seared foie gras with berry gastrique and roasted pears / Jumbo lump crab cake with green papaya salad / Seared sea scallops with southwestern spices. Traditional bisque with brandy, garnished with lobster cream. Mesclun greens, tomato, cucumber, red onion, fennel, toasted pecans and roasted pear. Hearts of romaine, Parmesan tuile and traditional Caesar dressing. White wine Dijon vinaigrette and garlic croutons. 10oz. center cut filet, seared duck foie gras and Muscovy duck breast; Red wine mushroom and peppercorn sauces, yam pureé. Yam pureé with brown butter, three chilies sauce with ancho, chipotle and guajillo. Herb chicken jus, bacon lardons, fricassee of vegetables and mushroom. Bamboo rice cake and sautéed baby bok choy. Cannellini beans ragout and arugula. Coriander dust, asparagus and caramelized shiitake mushroom. Couscous with pine nuts and golden raisins, preserved lemon, chive oil and tomato. Garlic spinach and sautéed baby carrots with ginger. Julienne of vegetables, red Thai curry, bamboo rice and lobster essence. Handmade pasta, asparagus, peas, teardrop tomatoes, Parmesan, garlic, parsley, basil and heavy cream. Suggested Wine Flight $35. Parties of six or more 18% gratuity added. $8 charge for sharing entrées. $40 per person minimum. Mashed potato, peas and pearl onion. 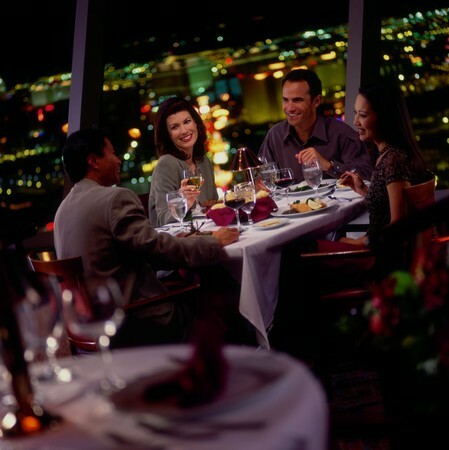 To have dinner while viewing the landscape of Vegas is a tremendous experience that anyone who visits Vegas shoould not miss. The food was excellent and the service was commendable. We were a party of 6 with one extremely picky eater for which the waiter was able to please even his appetite with great recommendations. Great Restaurant!! I would absolutely recommend this restaurant to anyone. It is a bit pricey, but the food is wonderful, and the view even more amazing, so that more than makes up for it. The waiters are very friendly and more than happy to take lots of photos for you! The view from Top of the World is definitely spectacular. However, the food was only average. I ordered the prawns and scallops, and they only came with 4 prawns and two scallops on top of a really large pile of couscous. At $44, those are the most expensive scallops and prawns I had ever eaten, in addition, the scallops were undercooked. Best part of the meal was the bread and the lobster bisque. Drinks were overpriced. As for service, the manager was very nice, the serving staff was a bit pushy about what to order. And the business casual dress code is apparently optional. There folks in there wearing jeans, t-shirts, and baseball caps. We were looking forward to the view and a great meal. We got the view but wasted $200.00 on the Lobster Bisque, Filet, Ribeye and Garlic mashed potatoes. You can get a better steak at OutBack for $20.00 and the Lobster Bisque at Costco has more flavor. We feel they use the view to draw guests and don't care about the product. I wish I would've paid to gain access for the view and eaten at the somewhere else.Not worth it!